When publishing a post on WordPress, it is common to include tags (keywords) so that users can use these as a search tool for locating other posts with similar content. (For more information, see the WordPress documentation). The Publish Form for creating a WordPress post contains a field in which tags can be added. When a Suggestion Provider is installed such as the one from OpenCalais, tags can be automatically completed when the user is entering them in the field. Figure: The auto-complete feature for adding tags in a Publish Form. When entering a single character, all available tags containing that character appear (here: countries). The user can make a choice from the list and enter the tag by pressing Enter. Step 1. 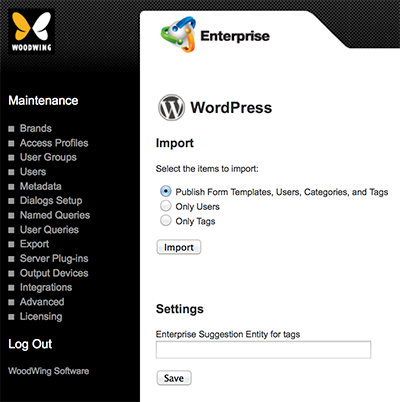 In Enterprise Server, access the WordPress Maintenance page.